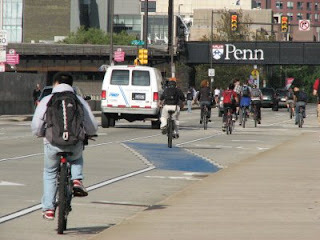 BCGP Board Member Kyle Gradinger took this shot of a bicyclists outnumbering cars on the Walnut St Bridge this morning. During one 15 minute period nearly 100 bikes were counted. We are just beginning our fall bike counts and results from the first few counts show a significant jump from 2006 when we did our last set of comprehensive bike counts. We'll post more info as we gather more data. I've had similar experiences riding my bike to work. One morning I was among at least 8 bicycles in a one block stretch between Bainbridge and Fitzwater on 7th. It was almost as if we were part of some kind of organized ride but we were all just bike commuters heading up 7th to Center City. Awesome. Oh wow! I love this i really really love this picture i think its great!